The room can accommodate between 20 and 25 people in a boardroom or café style layout and up to 60 people in a theatre layout. Please bring your own refreshments if you wish to have hot drinks. There is a hot water boiler and cold water dispenser fitted in the room. Disposable cups, holders and stirrers are all provided. There is a vending machine in an adjacent room which has a range of fresh bean coffees, hot chocolate and tea at £1 per cup. The room has a ceiling mounted data projector and panel to dock a laptop, a large wall mounted screen and wall mounted audio speakers. Full instructions for connecting to the panel are displayed on the wall next to the panel. 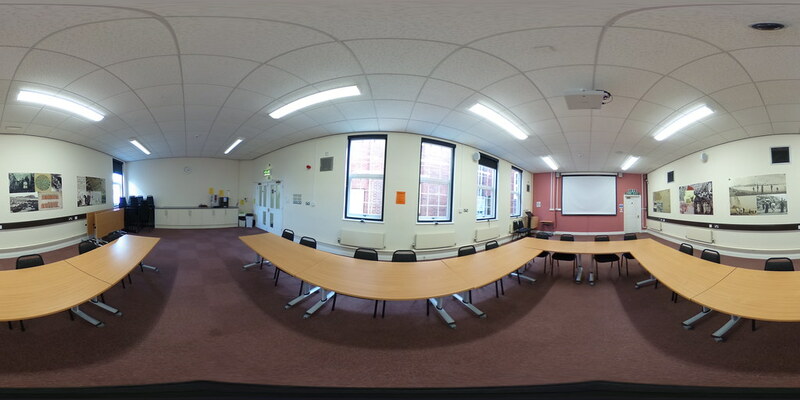 The History Centre is fully accessible, and the lecture room is conveniently located on the ground floor. During our normal opening hours you can hire the lecture room for £10 per hour, or £7.50 for charities. There is a minimum booking period of 2 hours. You can request to hire the lecture room in the evening or on Saturdays when we are normally closed. If you cancel with less than 3 days notice we will charge a £15 cancellation fee.